"I am very proud to be a part of Cats Protection - it is the best hobby in the world!!!" Are you pragmatic, flexible and a real team player? Do you love cats as much as we do? Then consider volunteering with the North Herts Cats Protection Branch! Home visitors - Such a rewarding role, having a key part in the re-homing of our cats and kittens by visiting potential owners in their own homes. Fostering a cat or kittens for a short time until a new home is found. A really hands-on job which can be done in a spare room or cat cabin in your garden. Rescue work - Helping unwanted, stray and abandoned cats and kittens. Helping at events - We always needs people to help set up and staff our stalls at events. It's a great opportunity to meet like-minded people and have some quality cat chat! Collecting/sorting bric-a-brac - If you like a rummage and have wheels, this could be the ideal role for you! Have a collecting box at work and/or home and collect all that spare change to help fund our branch. Car booters - Do you love car boot sales and fancy doing some for our branch (with our goods)? We're ready to go if you are! It's up to you how much and when you help. You can work as well as volunteer with us - most of us fit our volunteering around our full-time jobs. The qualifications we ask for, apart from the love of cats, are that you have a sense of humour and can work as part of a team. You will have to remain calm and logical in difficult situations and not let your heart rule your head. You will meet some interesting people and gain a sense of achievement from doing your bit to assist the poor, sick and needy cats in the North Herts area. Please contact us if you're interested in joining our enthusiastic team! 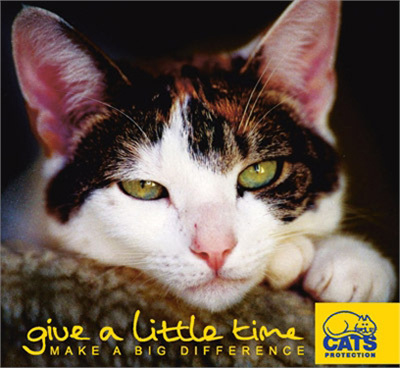 Cats Protection’s volunteers carry out the majority of its welfare, fundraising and education activities and each group relies on a steady stream of willing volunteers to support the charity in meeting the needs of the cats in its local area. This role aims to help the Branch to promote awareness of its volunteer opportunities and to recruit sufficient volunteers to meet its needs. The Recruitment Officer will work with a wide variety of local people and organisations to promote awareness of local volunteering opportunities with Cats Protection. They will be responsible for meeting with potential volunteers and matching them with suitable opportunities. They will also work with other group members in identifying volunteering opportunities and help new volunteers to settle in to their roles. Good communication skills, administrative skills and IT skills together with a knowledge or experience of volunteering and/or recruitment are needed for this role. An enthusiastic and outgoing personality will be an asset, as duties involve liaising with a wide variety of people and developing their enthusiasm for the charity. Experience of interviewing people, either formally or informally and an ability to put people at ease would be useful. Recruitment materials are developed and produced by the charity. There is an email networking group with other Recruitment Volunteers. Centrally, the Branch Support Unit can assist with large recruitment initiatives and CatNav (CP’s extranet website) provides a resource for sharing and developing recruitment ideas and techniques. This is a flexible role, and may only require 1-2 hours of commitment per week (sometimes more, sometimes less). A more detailed role description is available on request. If you are interested in this role, please get in touch using the form on the Contact Us page or call us on 01438 228877, and a member of our team will be happy to have a chat. Cats Protection HQ provide optional training to all of our volunteers, to ensure we are all working towards the same goal, and so that we all have the best possible understanding of the welfare needs of cats in our care. If you are interested in joining our friendly team, please get in touch - we look forward to hearing from you!